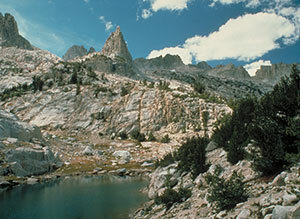 The United States Congress designated the Hoover Wilderness (map) in 1964 and it now has a total of 128,221 acres. All of this wilderness is located in California and is managed by the Forest Service. The Hoover Wilderness is bordered by the Yosemite Wilderness to the west. First established as a Primitive area in 1931, then a Wild area in 1957, the Hoover Wilderness was one of the original members of the NWPS. Here is an extremely rugged and magnificently scenic area in California's Sierra Nevada Range with elevations from around 7,000 feet to more than 12,000 feet, a region of alpine lakes and lovely meadows but little timber. The scarcity of firewood has resulted in a ban on wood fires in the very popular 20 Lakes Basin, above 9,000 ft. elevation in Virginia and Green creeks, and near Barney and Peeler lakes. Rainbow, brook, and golden trout inhabit the lakes. If you travel with stock, you should pack in all your feed. You may see cattle and sheep grazing, as some permits were issued to ranchers prior to designation. The presence of black bears should encourage you to carry a bear canister (in the Humboldt-Toiyabe National Forest portion of the wilderness) or hang your food at night (in the Inyo National Forest portion). Rain, snow, strong winds, and bitter cold can occur in all seasons. The Hoover Wilderness shares its western border with Yosemite National Park and permits are required to hike into the park as well as additional restrictions. The area, with its well-maintained trail system, receives heavy human use. You'll encounter the least human traffic in the northern portion, but, all things considered, this Wilderness would fare better with less visitation. Planning to Visit the Hoover Wilderness? How to follow the seven standard Leave No Trace principles differs in different parts of the country (desert vs. Rocky Mountains). Click on any of the principles listed below to learn more about how they apply in the Hoover Wilderness.